Moira Gordon was the eldest daughter of David Wilson and was born on 14th May 1914. President, Irish League Golf Union	1967-1970 and 1976-1978. During the Second World War she was a Junior Commandant in the Auxiliary Territorial Service in Northern Ireland of which she and Daisy Ferguson, a daughter of Stanley Ferguson and also a keen golfer, were in charge. Moira and Daisy were to end up living close to one another in Newcastle. Daisy lived at Spelga Avenue and Moira lived in a bungalow on the Bryansford Road in Newcastle, spending most of her life doing what she enjoyed most - playing golf. 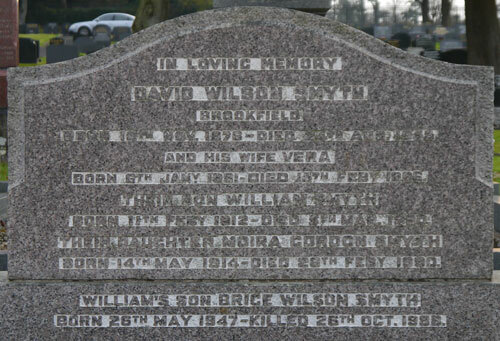 In latter years due to ill-health she went to live with her sister Vera near Dungannon. Another talent of Moira's that not many people knew about was her superb public speaking ability, which enabled her to deliver very witty and entertaining speeches. She died on 26th February 1990 aged 75 years and was buried in the family grave.